Cash for Notes — 100K Investing, LLC. 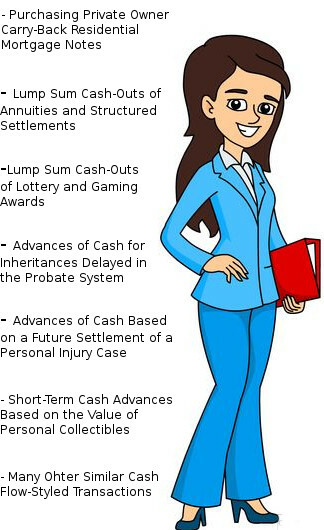 Our experienced contract buyers can also provide you with many "FAST CASH" payment options including a full LUMP SUM purchase, a purchase of a portion of the remaining balance of your note or obligation, or even the purchase of a set number of future payments providing you with the exact amount of FAST CASH your require. Want to find out more? We can provide you with a "confidential evaluation" and conditional quotation on your mortgage note, structured settlement, gaming award, or any similar cash flow within 24 hours of submission. For lottery, small business notes, factoring, and all other cash contracts, click the Contact Page.